Do You Feel Tighter in Games Than Practice? You must find the real culprit to the tension. You probably think tension is the real problem. The “tension” you feel does not happen all on its own. Something else is at the root of the problem, which most players and coaches don’t see on the surface. Here’s what I mean: Most likely, when you play in games, the outcome is more important to you (for many reasons I won’t go into here). For most players, they want to play well or win so badly and they can’t handle failure. This mindset causes you to worry about failing or not playing to your capabilities, a root cause of fear of failure. 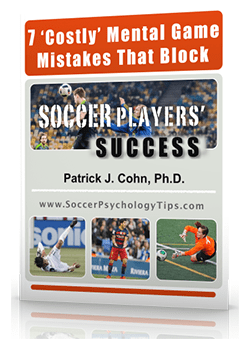 Now take note, here is the real culprit to the tension – the fear of making bad passes or losing the ball causes you to lose trust in your skills. The lack of trust causes the tension, but this started with the fear of messing up or wanting to play well so badly. So, you have to get to the root cause of the tension instead of band aiding “tension” with relaxation training. Most people don’t get this and look for quick fixes to rid themselves of tension. 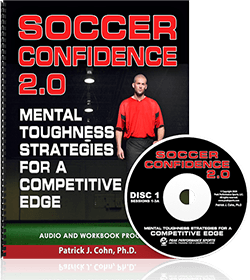 The only way you are going to play freely and trust your skills is to rid yourself of the fear or pressure-packed expectations you have about the game…. My program will change the way you think – literally – about your game! 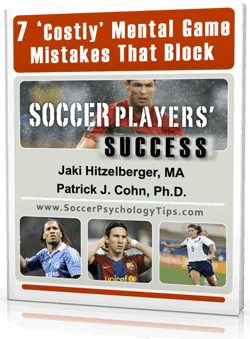 Soccer Mental Training – Get Mentally Tough For Games!